thebahamasweekly.com - Grand Bahama Regatta, Now Underway! Grand Bahama Regatta, Now Underway! 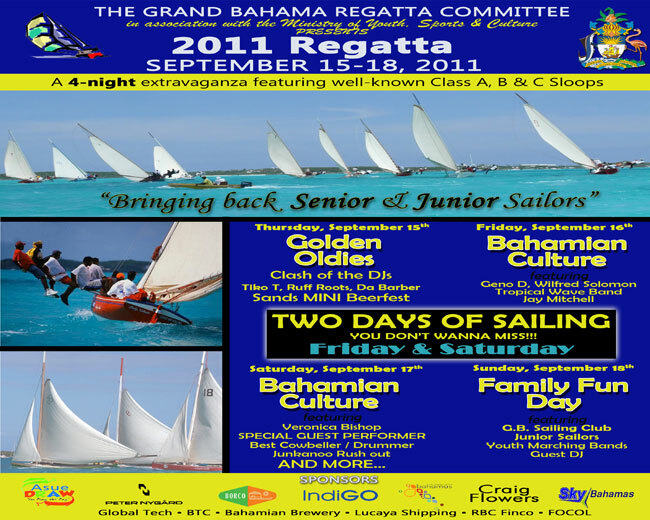 Freeport, Bahamas - The Grand Bahama Regatta Committee, in association with the Ministry of Youth, Sports & Culture present the 2011 Grand Bahama Regatta! A four-night extravaganza featuring well-known Class A, B and C Sloops all off Taino Beach! Bahamian Culture Day - Friday, September 16th featuring Veronica Bishop, local band, and guest DJ. Bahamian Culture Day 2 - Saturday, September 17th featuring local bands, Bahamian artists, Junkanoo rush and more! Family Fun Day - Sunday, September 18th featuring the GB Sailing Club junior sailors, youth marching bands and a guest DJ. "We don't go big, we go GRAND!"